Quote Reply Topic: SWFA SS 10x42 Tactical 30mm Riflescope Manual? I just aquired a Super Sniper 10x42 m Tactical. My question is: Where can I get a manual for it? Since I bought it used there was no manual included. An operation manual for the scope so that I dont have to spam this great forum whenever I have a question. The Mods nor the forum membership would consider it "spamming" merely asking questions concerning the features or function of the SS rifle scope, my friend. It's what we do here. Most questions concerning the SS scopes have been asked and answered on this fine forum multiple times over the years and can be obtained by utilizing the forum search function. However, some spec questions you may have, might be answered by reading the SS website. And welcome to Optics Talk. My question is: Where can I get a manual for it? The answer to your question is: Nowhere. There is no operator's nor technical manual for those scopes. You simply have to ask someone if/when you don't know something. Well, there WAS a manual that came out with the SS, but the manual was still labeled by Tasco. My beloved 10x rear focus SS came with one. http://kentonindustries.com/custom-turrets/swfa aftermarket turrets can be custom engraved to reflect the balistics of your specific cartridge, elevation etc. 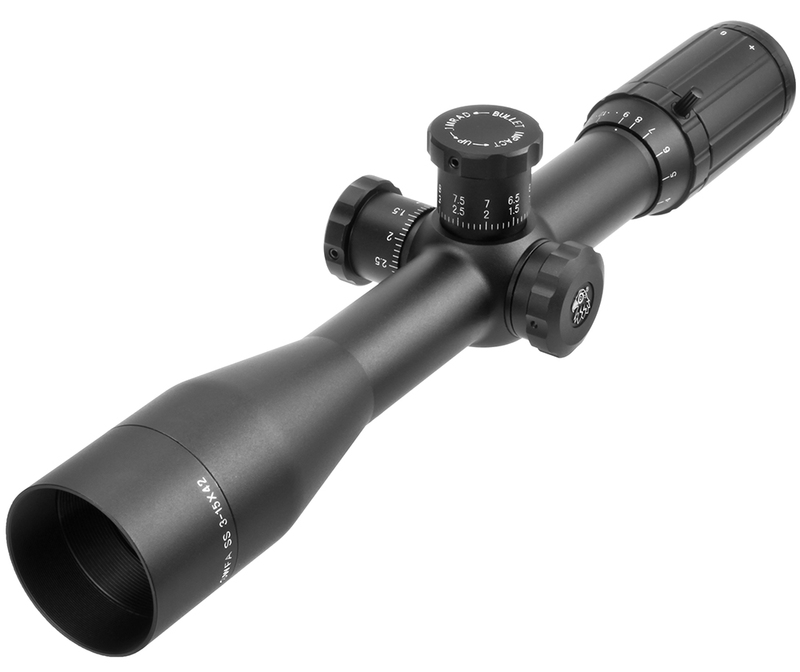 Can anyone tell me how much elevation and windage the mil/mil version of the 10x42 ss $299 scope has. The only thing i can find is the review snipercentral reviewd stating that the moa version has which was 156 moa elevation. Can someone please clarify. The swfa website for total elevation and windage just says mil for each category. You can turn it all the way down then count the mils as you turn it to the top until it stops. Do the same with the side for total windage. How about the rear focus? Introducing the latest additions to the SWFA SS scope line. First, we will introduce the SWFA SS 3-15x42 MQDM SFP. On the outside it is almost identical to our existing SWFA SS 3-15x42 FFP. 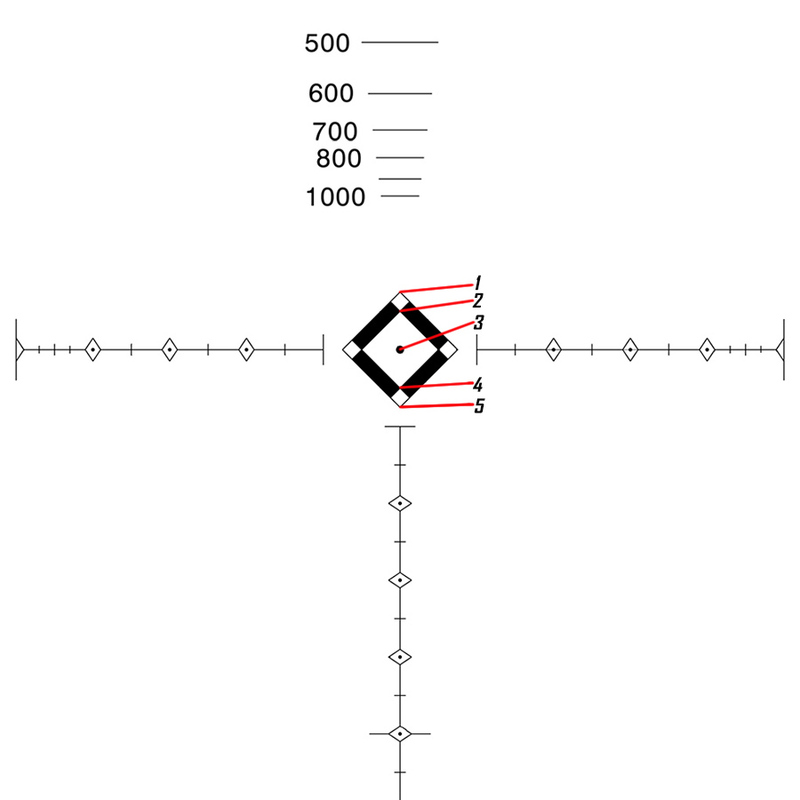 However, the reticle in this 3-15x42 is based off of the extremely popular 1-4x24 MQDM we released last year. Like its predecessor, this scope also has a reticle in the second focal plane which gives you better target acquisition on low magnification while maintaining its ability to range and provide aiming points at max magnification. It utilizes a Mil based reticle and has the ability to provide the shooter with accurate target distances utilizing the built in target ranging references. The ranging references can be used to range various objects in various sizes. You can range anything 72", 36", or 24" tall as well as any object 18" wide. 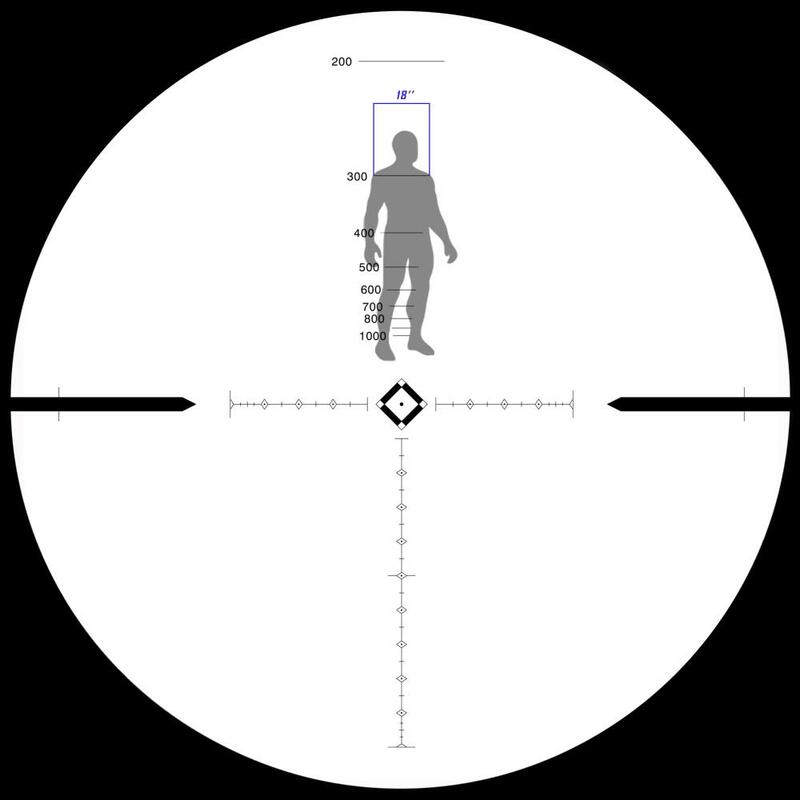 This gives you the ability to range objects such as human silhouettes, IPSC silhouettes, deer, hogs, or even coyotes. The power ring comes threaded for a throw lever, which is included. This gives you the ability to rapidly zoom in and out. 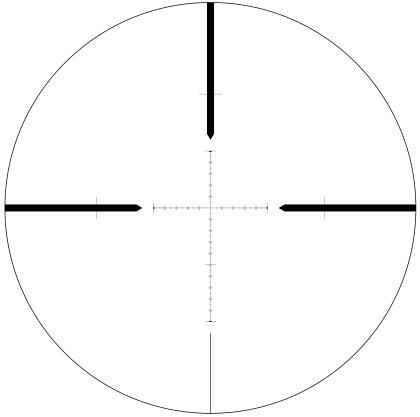 Unlike the 1-4x24 we released last year this reticle in the new Second Focal Plane 3-15x42 has the ability, due to its higher magnification, to easily utilize not only the outer vertices of the diamond as aiming points but also the inner vertices, giving you five aiming points instead of three. These aiming points can be used for a wide variety of calibers. 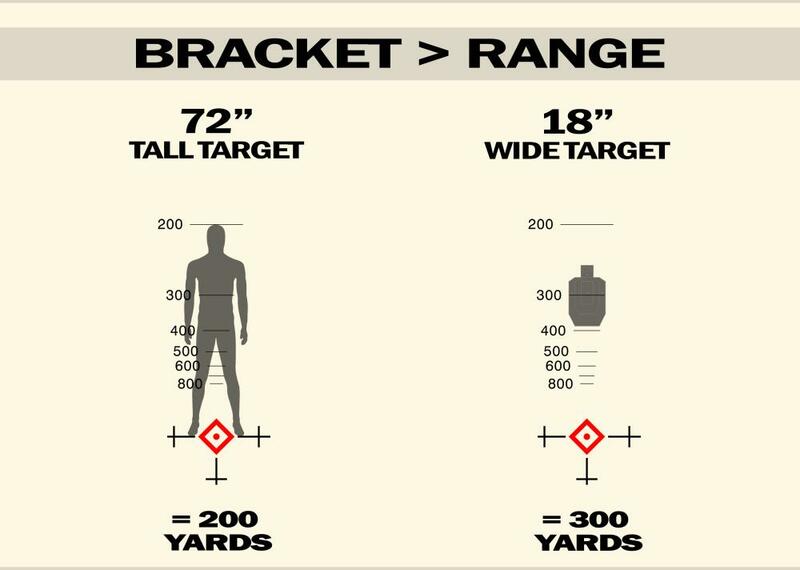 Below are some examples of how this could be utilized with a few different calibers. All of the target ranging references are calibrated for 72" height as well as 18" width. 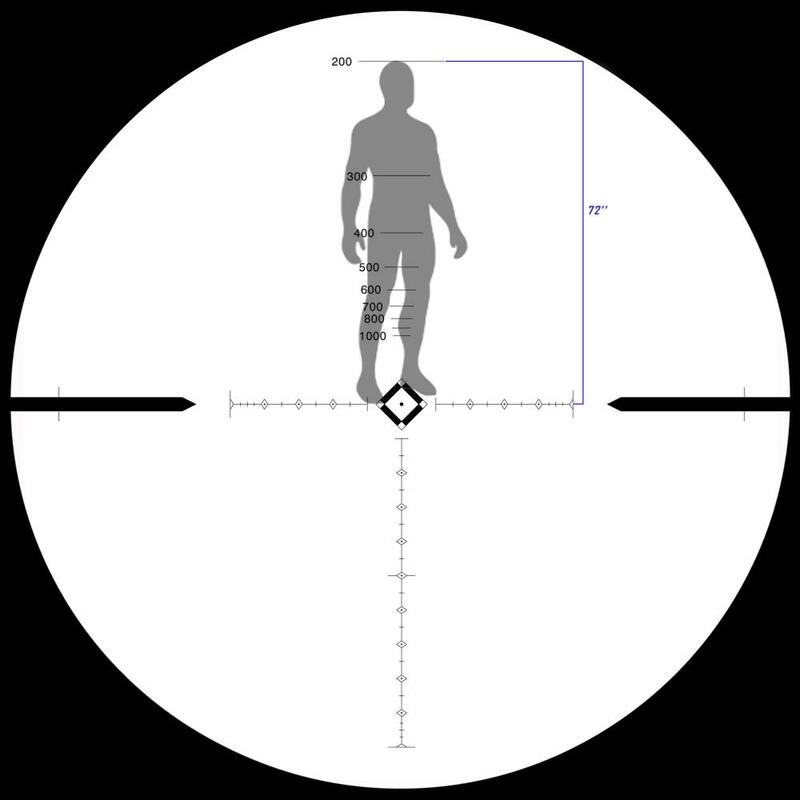 To use it for 36" tall targets simply divide your range shown on the reticle by 2 and for 24" tall targets divide by 3. Examples are listed below. The target below is a 72" tall silhouette of a human. 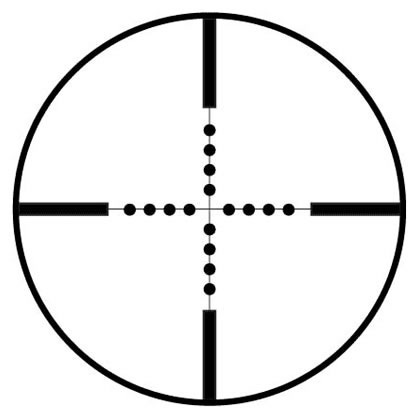 Considering it is 72" tall and fits just between our horizontal crosshair and the 800 yard target ranging indicator this target is 800 yards away. The target below is a 72" tall silhouette of a human. 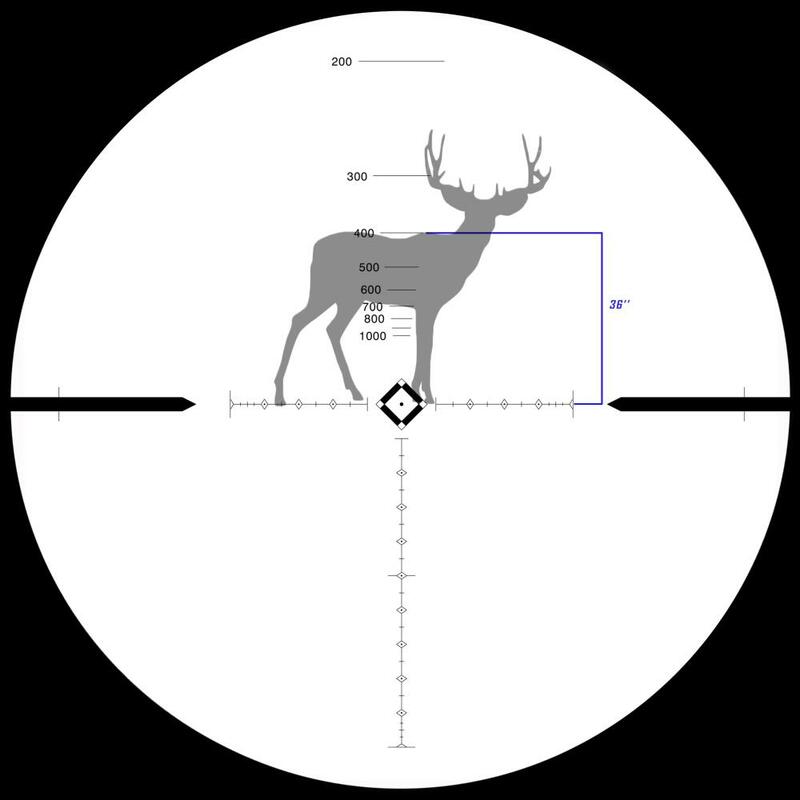 Considering it is 72" tall and fits just between our horizontal crosshair and the 200 yard target ranging indicator this target is 200 yards away. The target below is a 18" wide silhouette of a human. Considering it is 18" wide and fits just on top of our 300 yard target ranging indicator this target is 300 yards away. 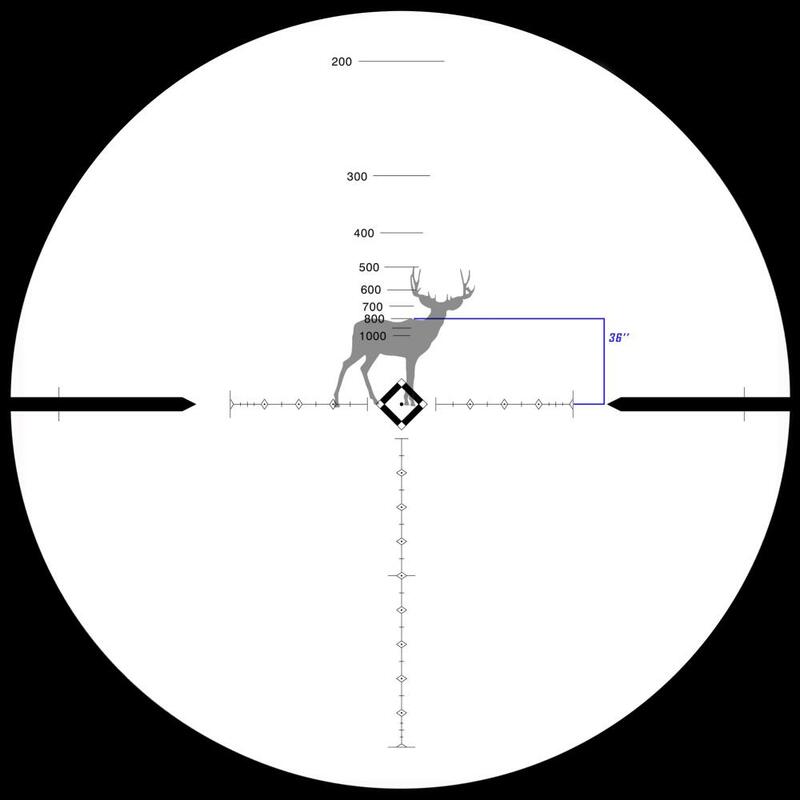 The target below is a 36" shoulder height silhouette of a deer. Considering it is 36" tall and fits just between our horizontal crosshair and the 400 yard target ranging indicator this target is 200 yards away. It is 200 yards away and not 400 yards because we are using a target that is half the height of what the target ranging references are calibrated for, so we have to divide the given range by 2. 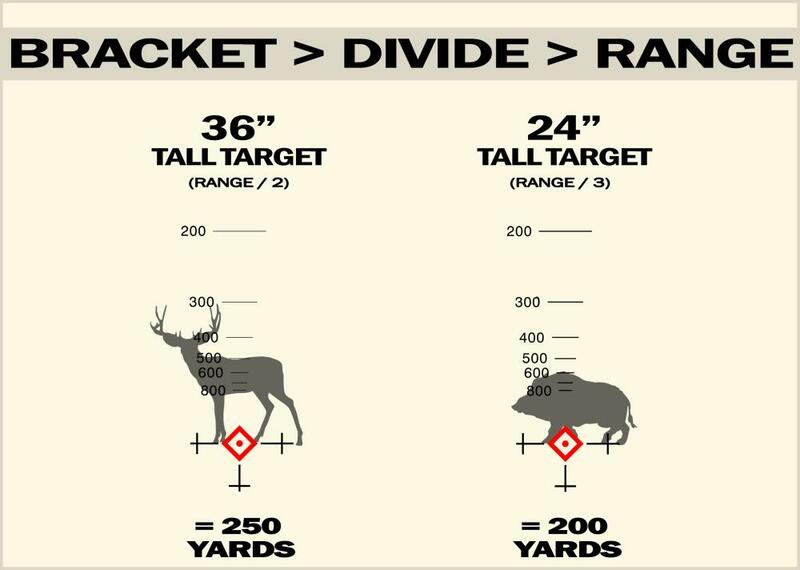 The target below is a 36" shoulder height silhouette of a deer. Considering it is 36" tall and fits just between our horizontal crosshair and the 800 yard target ranging indicator this target is 400 yards away. It is 400 yards away and not 800 yards because we are using a target that is half the height of what the target ranging references are calibrated for, so we have to divide the given range by 2. 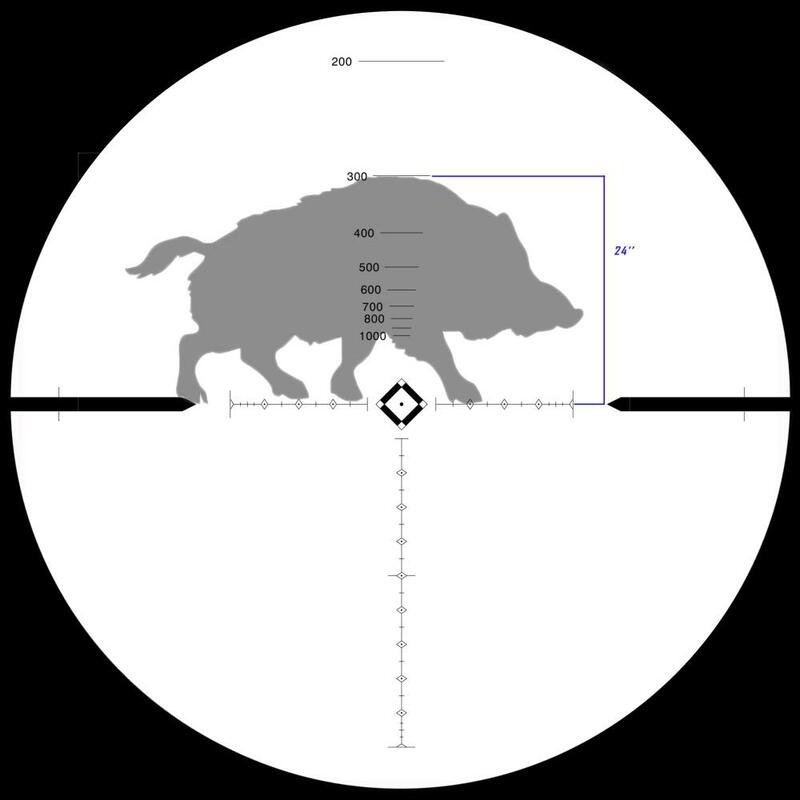 The target below is a 24" shoulder height silhouette of a hog. Considering it is 24" tall and fits just between our horizontal crosshair and the 300 yard target ranging indicator this target is 100 yards away. It is 100 yards away and not 300 yards because we are using a target that is one third the height of what the target ranging reference is calibrated for, so we have to divide the given range by 3. [QUOTE=Stevel610] You can turn it all the way down then count the mils as you turn it to the top until it stops. Do the same with the side for total windage. Thx for the reply but i dont own the scope. I was hoping to use the info as part of the decision making. To get mils from MOA, you just divide the MOA/3.438. So your 156 would be 45 mils. The specs listed on the website for SS scopes is usually very conservative. All the SS scopes I have owned have had a lot more than listed in the specs. I did see his post but he posted about a different model so i didnt want to assume that it was the same elevation and windage. Not to be doubting thomas here but i also found an answer over at snipercentral.com the answer there was,42.8 mils of elevation. Mel over at sniper central did a review on the scope, the moa version thats where i got the 156 moa as a noob i didnt want to assume that the adjustments could be figured out with the formula manufactures have been known to manufacture products outside of what common sense would warrant. I also resourced the manufactures website but unfortunately they only say mil next to total windage adjustment and elevation adjustment. Needless to say i am confused. It doesnt matter much however because 42.8 mil adjustment or 35 mil adjustment still covers my needs. Thanks for yoir replies everyone. i appologize for all the mistakes in my last post. when responding to the thread on my phone i have no review of what was said before me so on top of spelling mistakes and information errors it looks like im stupid. ok all, i just got off the phone with SWFA, i figured if anyone would know they would know and the answer is.... wait for it... no one knows. I was told the only one who is going to know how much elevation the scope is going to have is me after i order it, i was told from scope to scope with the mil versions its going to vary how many mils of adjustment that particular scope is going to have. they told me that their intentions are to manufacture each scope with the maximum amount of elevation available and some could be more some could be less the only way to know is to order one and figure out how much my scope has, but that they would guarantee a minimum of 30mrad of adjustment. I asked if this was why they post the numbers for the moa scopes and not the mil scopes, i was told "yep." (thats a direct quote.) not exactly sure what to think about that. still a minimum of 30 mil adjustments is sufficient for my needs. thought this would be of interest to everyone. That has always been the case with SS scopes. As I said in my post before, when they list a spec it is usually very conservative. They often have much more. Welcome to the OT. You ain't the first one and you won't be the last. And probably will be again. I have owned a lot of the SS scopes and while I have run out of adjustment on other brands of scopes I have never had that issue with an SS scope. I as much as anyone appreciate the importance of the question you asked so I tried to post what information was officially available hopeful that some of it might be of use. I will say that there are enough rotations of the turret that it is easily possible to get lost in the dial and suggest that once you establish you zero that you make a mark on the inner part to show the correct level of the Zero. This can be as simple as a piece of tape or a scratch from a knife or a marker pen. One other thing that I think can be quite useful is ordering a set of Kenton Ind custom engraved turret knobs for the caliber and specific load that you settle into. I do appreciate the info urimaginaryfrnd. I didnt understand what i was asking. Meaning i am too new to know i was reading over the information given to me. It wasnt until i got off the phone with skar at swfa that i understood all the info that was already given. Thanks for putting up wit it. I was too perplexed that no one had an answer now i know why. I still will be purchasing one. Would you still want to use a 20 moa base with a scope with so much adjustment? How far do you really anticipate shooting...the majority of your time? A .308 Win, I presume? With the least elevation I ever heard of on an SS scope, your going to get out to, (probably past) 1000 yards with a .308 and a 175gr bullet. There's member's here that do that regularly with their SS scopes. I think you might be getting wrapped around the axle on how much "up" your going to have. Respectfully submitted and welcome to Optics Talk.